First and foremost, learn to swim before heading out to any swimming area. If you are not a strong swimmer, or you are getting tired, wear a life jacket. 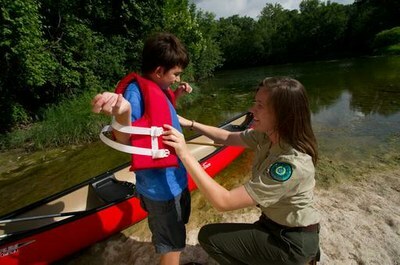 Children are strongly encouraged to always wear life jackets while swimming in lakes and rivers. Be aware of your surroundings. Lakes, rivers and streams are natural environments. Watch for sudden drop offs, changing bottoms and potential for unseen limbs, rocks, and other objects. Stay hydrated. Summer heat can contribute to dehydration, even when you are swimming. Take frequent breaks, wear sunscreen, drink plenty of water and avoid alcohol. Never swim alone. Even the most experienced swimmers can tire or get muscle cramps, so having a buddy can be helpful. Supervise children at all times. Drowning is the second leading cause of accidental death among children, so keep your eyes on your kids. It only takes a moment for a child to slip below the surface. Assess your skills and don't take chances. Know your swimming skills and don't rely on flotation devices. If you don't know how to swim, do not get in the water, even with a raft or other flotation device. Swim in designated swimming areas. Park staff members have made careful decisions about the safest and best places for swimming. Please swim only in designated swimming areas. Water can look calm on the surface, but be aware of currents under the surface. Whether you're swimming in a lake, river or ocean, underwater currents exist and can put you in danger. If you find yourself in a current, do not swim against it. Instead, swim with it until conditions are calm enough for you to swim to safety. Be aware of changing river conditions. Swift currents from flash flooding can happen in an instant. If you notice the water rising, turning muddy or changing, leave the area immediately. Wind, tide and currents all contribute to water's conditions. If you have questions or concerns about swimming conditions, ask park staff. Contact park staff or call 911 immediately if anyone is having trouble in the water.